I ran into Brent Doscher at the Mount Washington Valley Ice Fest. We were both assigned to photograph some climbing clinics. 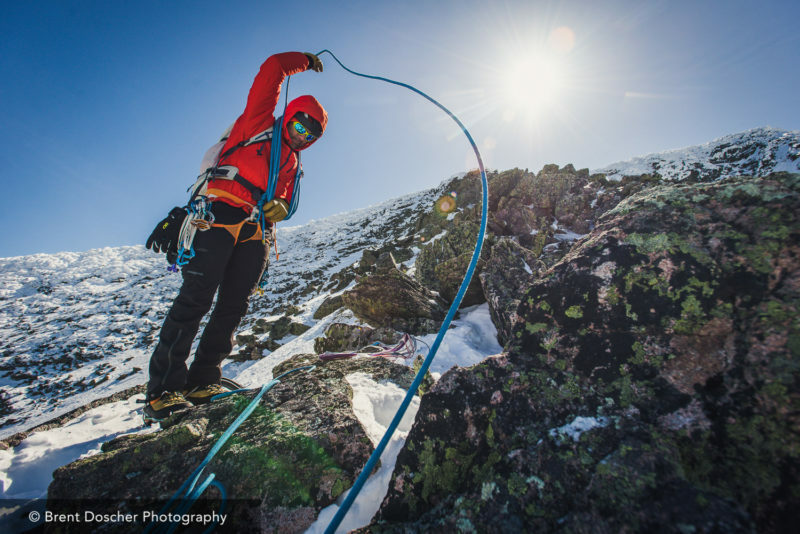 Prior, to that, he had generously provided some images for my article highlighting a climber in New Hampshire. Upon receiving the images, I immediately knew I needed to know more about him. His photographs had original and unique perspectives that only come with innate talent and years of experience honing his skills. Scrolling through his portfolio, I found myself getting drawn into the experience in which he was photographing. 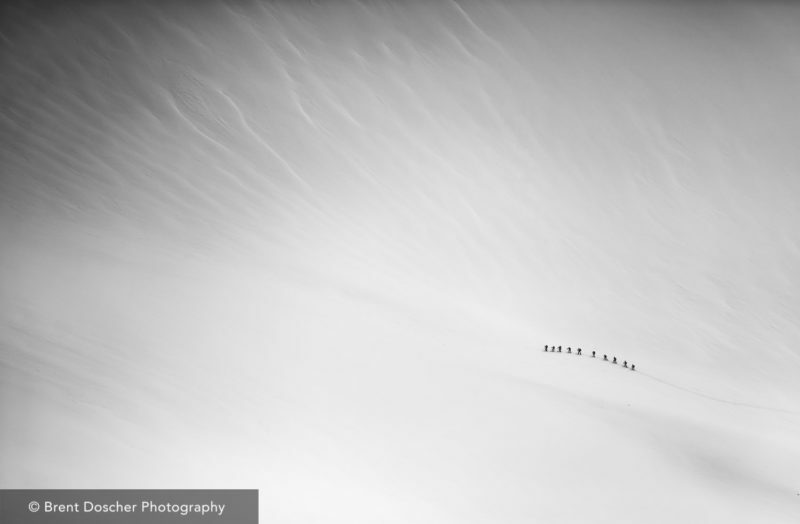 An extraordinary photograph will take you on an adventure with that single image, and that’s exactly what his work accomplishes. I didn’t spend long talking with Brent when I ran into him in last month, but we kept in touch and I was glad I was able to catch up with him recently and ask him a little more about himself and his photography. How did you get into sports photography and can you describe the evolution of your career? I’ve been shooting professionally for 14 years; it all started with a senior project in high school when I chose sports photography as my subject. I learned as much as I could about cameras and photography as I shot my high school sports teams and then graduated onto the University of New Hampshire sports teams during my time there. After completing my degree at UNH with a minor in studio arts, I started my own event photography business. That business grew until it was an international company photographing 100 events per year, covering Spartan Races, marathons, triathlons, and heaps of other endurance events. Eventually it grew large enough that I sold it to another company, Gameface Media, and went to work for them as their director of photography where we grew the business to covering 300 events and millions of athletes per year. 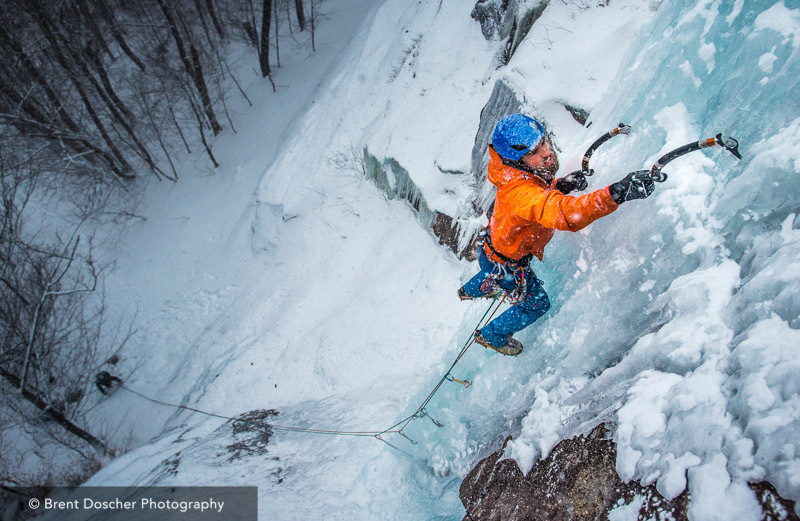 It was during my time there that I fell in love with climbing, both rock and ice. Ironically enough, I originally started ice climbing because I wanted to take pictures of it and figured that I should learn how to climb first. It turned out I loved climbing just as much as I love shooting it. In mid-2017, I parted ways with Gameface to try and make it on my own as an adventure sports photographer. Recently, I’ve been fortunate enough to land the cover of Trout Magazine and Wild Northeast’s fall issues, and my work has previously appeared in Men’s Journal, Runner’s World, Outside Online, and Climbing Magazine. In your opinion, what makes a great image? Great energy makes a great image, first and foremost. Everything else comes second. If you look at the best images that exist in the world, no matter the genre, the mood of the photo is what draws you in. I’ve taken countless photos under amazing sunsets or sunrises that just fall flat because they’re lifeless. As such, they become disposable and you never really look back on them. The images that stick in your mind are those where the subject’s energy can draw you into the photo and instantly captivate you. What is your motivation/inspiration behind climbing and photography? 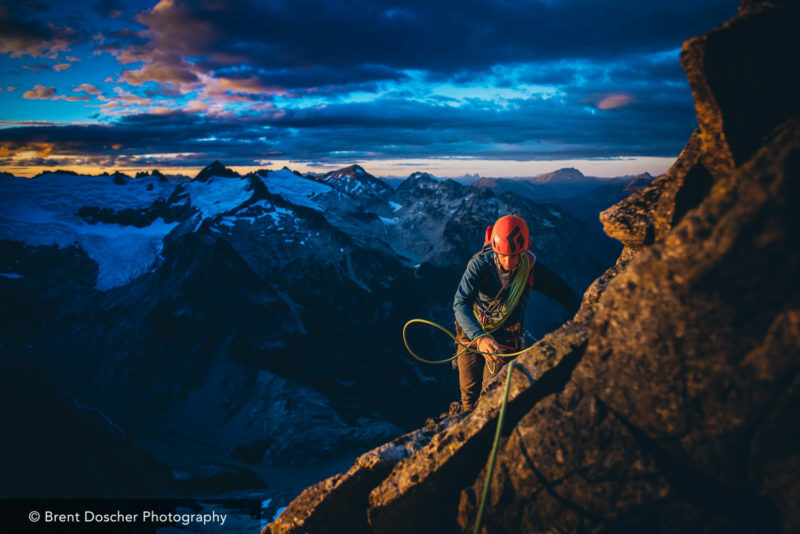 Whether I’m photographing climbing, fishing, running, or anything else, the style that I always tend to strive for in my shots is capturing the connection between the subject and nature. The best photographers in the industry are capable of capturing these amazing scenes that show you the beauty of this world at its peak moments, and by having a human subject in that image they can essentially transport you into the scene so you can feel what it would be like to be a part of that beauty. What was your most rewarding experience photographing a subject? It’s hard to nail down a specific experience. The ones that always stand out the most are the shoots where I can be part of the objective. 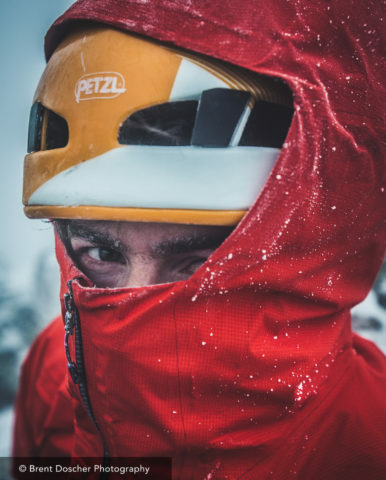 Being on the climb with the athletes and getting to experience all the thrills of an alpine objective alongside them is one of my favorite things about shooting ice and alpine climbing. 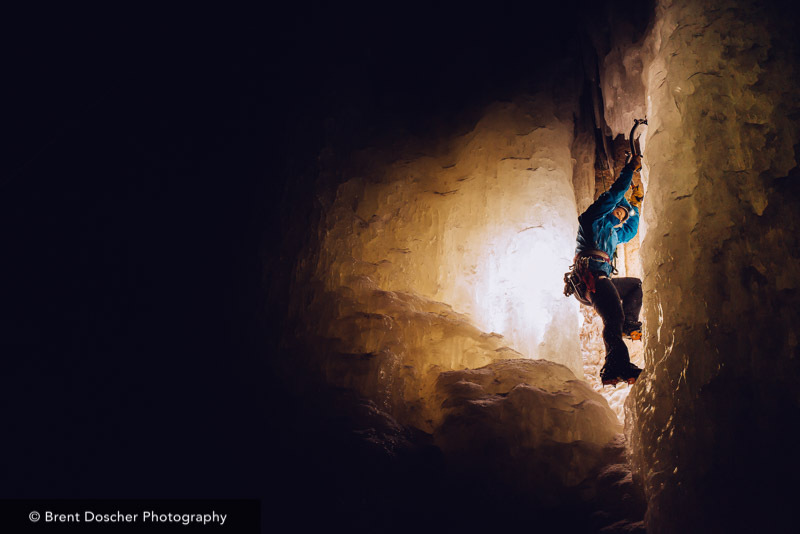 Climbing and photography are both passions that require 100% percent of your mental energy to execute correctly, especially when you are near your limits. You have to be so dialed in your systems on both the photography side as well as the climbing side in order to make sure you never miss a moment. Additionally, you have to think through and plan every single section of the route not only from the climbing aspect, but from a photography aspect as well. I certainly still have an immense amount to learn on both sides of the house, but that’s what makes it a fun challenge. Being part of the experience that you are documenting certainly makes for more raw and powerful images. Looking back at my photos, I frequently remember the feeling I had when I was taking specific shots, and remember the emotions of everyone else in the photo. The challenge is to convey those emotions in your imagery so that every viewer can sense the elation or despair, whatever it may be. The most challenging shoot was when I climbed Mt. Shasta with a friend. I didn’t have much time to adjust to the altitude, so the final 500 feet of elevation before the summit was pretty rough for me. Going upwards was hard enough in itself; throwing photography into the mix when you’re feeling that poorly makes for a pretty rough time. 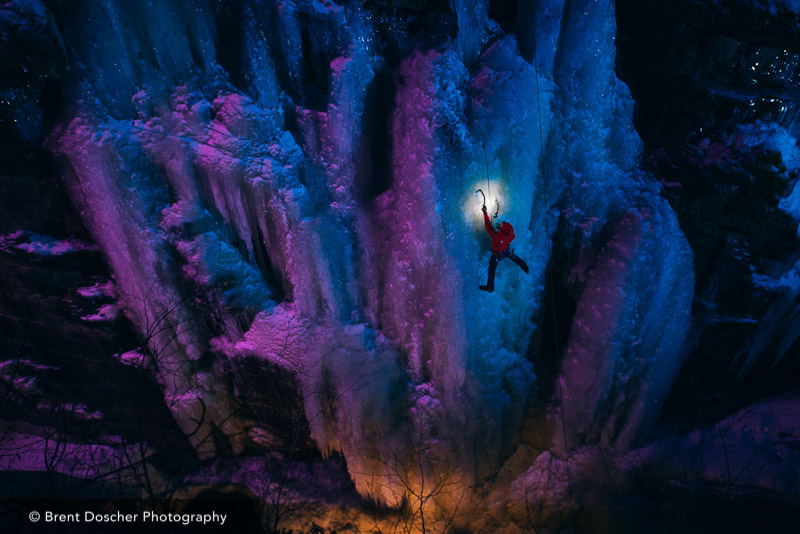 Do you feel any responsibility as someone who is showcasing the sport in images to make sure the viewers perceive climbing in a certain way? For example, would you photograph solo climbing? That’s a great question. I don’t personally feel that it’s my duty as a photographer to document only best practices. Speaking strictly from a photographic standpoint, often the most dangerous objectives make for the most impressive photos. I think that to the outsider, all climbing looks dangerous, and there are many aspects, free-soloing included, that the uninitiated would never understand. However, I’m not going to avoid shooting something because I wouldn’t personally choose to do it. There are people out there doing insane things every day, and they should be documented. What equipment do you usually bring on a shoot? I pack a variety of equipment depending on the objective. If we are going cragging and I can afford to bring a bunch of gear, I’ll pack a kit of multiple camera bodies and lenses so that I can have a bunch of different choices for focal lengths while I’m shooting. However, if we’re headed into the alpine I usually only bring one light DSLR with a couple select lenses; recently my picks have been the Nikkor 20mm f/1.8 and the Nikkor 50mm f/1.8 for their light weight. How is doing work in the Northeast different from other places, and what do you like about it? I think the Northeast has definitely been underrepresented in the past few years. With the explosion of social media, everyone is always clamoring to visit the locations with the grand, sprawling views. The Northeast doesn’t really have many of those, so I understand the draw to the Western US. However, what the Northeast lacks in grandiosity, we make up for in intensity. We have some of the burliest conditions in the lower 48, and I really love the challenge of trying to capture that in my imagery. Last year while we were on a ski trip in the north of Iceland, I was driving around town, witnessing the frigid living conditions first-hand. I said to a friend, “Why do people live here? This life is so brutal, cold and windy all the time.” His response to me was, “Why do we live in New Hampshire?” There’s something uniquely alluring about life in northern New England. It’s certainly not an easy life, but that’s what makes it exciting. 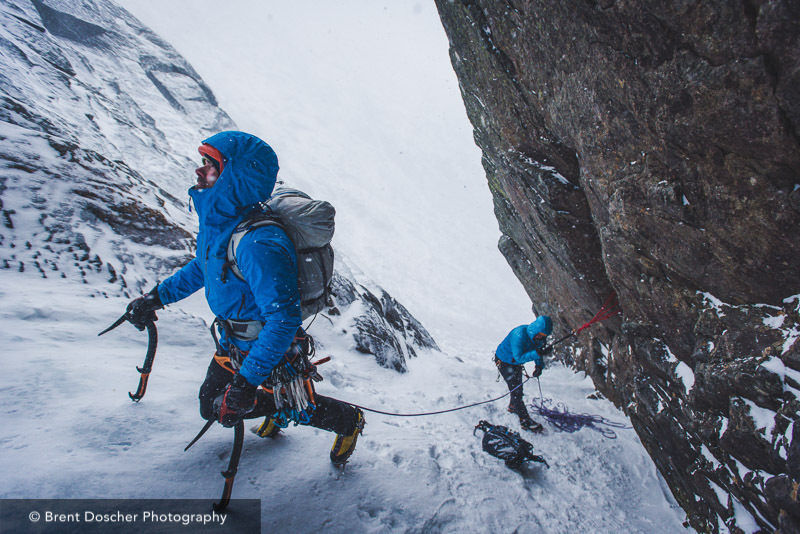 Climbing is no exception to that. Our climbs can be dirty, overgrown, sweltering hot, or even covered in the snow, but it makes our area fun and it’s what I try to capture. What’s one dream photography destination? Last year on a flight back from Iceland, we flew over Greenland. I’m pretty sure my jaw actually dropped when I saw all the snow covered mountains. Ever since then I’ve been scheming of ways to get there. Do you think about how you want to compose a certain shot a day/week/month before, if it’s a big job? I definitely do. It’s a trap, but I do it anyways. One of the biggest challenges that I think every photographer learns to deal with is not always nailing the shot that they envision. No matter how large of small the shoot is, I’ll generally research the climb and go into the shoot with a few different ideas for images I’m really stoked on. Of course, 95% of the time they don’t pan out, and it’s really easy to get frustrated. However, so much of climbing and photography is just learning to adapt to the conditions, so you have to adjust. Learning to spot and capture the unplanned moments is something that comes as a great challenge to me, but I’m constantly trying to improve on it. Any advice would you give aspiring sports photographers? Spend more time studying your idols than studying the equipment. When I first got into sports photography, I was so equipment obsessed that most of my time was dedicated to researching the newest and best camera gear. I think a lot of sports photographers fall into this trap, since it’s a very equipment-heavy genre of photography. However, once I stopped caring about the gear and instead spent all that time studying the images from the greats in this industry, I drew a lot of inspiration and my photos got much better. Also, get used to the alpine start. There will be a lot of them. You can see more of Brent Doscher’s work in the Northeast and beyond on his website: www.brentdoscher.com and you can follow him on Instagram at @bdoscher.